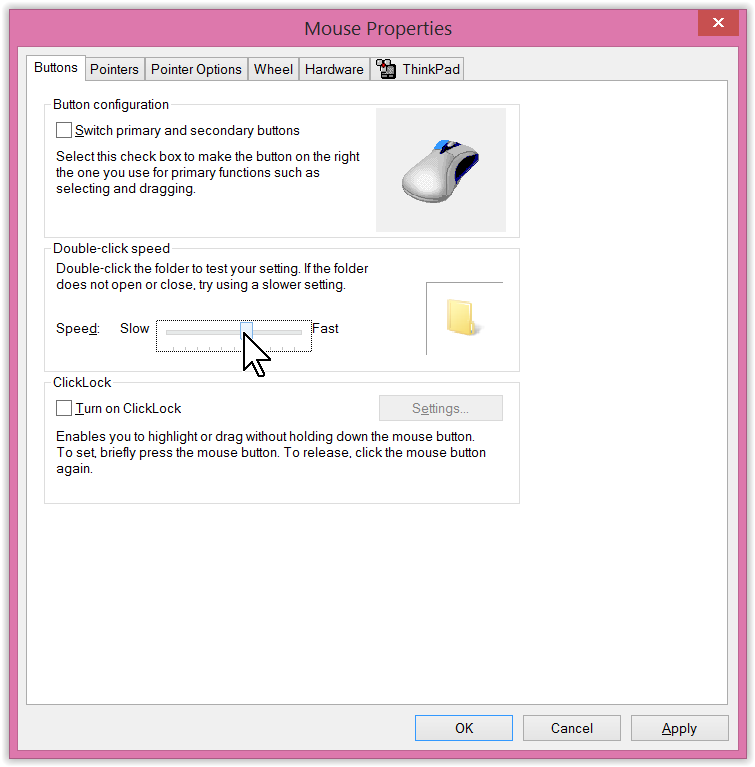 If you’re finding the computer mouse difficult to use you might to think about making some changes in Windows or downloading some free software to help. For many people, however, a specialist alternative to the regular mouse will provide the optimum solution. Here are some of the more popular options currently available to you. Sometimes changing the shape, size and weight of the mouse can make it much easier and more comfortable to use. The Tiny Mouse is significantly smaller than a regular mouse. Younger users can find it difficult to comfortably grasp a full-size mouse and reach the buttons. The buttons also have coloured spots marked on them (blue for left and red for right) for youngsters who are unsure which is which. This mouse connects to your computer using the standard USB connection. See a list of ergonomic mice at EmpTech.info. The main advantage of the trackball is that you don’t need such accurate finger and wrist movements to use it. An additional benefit is that the mouse button is separate from the movement of the ball – therefore making it easier to hold the cursor over items while clicking. The BigTrack is a sturdy rollerball designed for early learners. It has a large, bright yellow ball that rolls smoothly and two large buttons corresponding the left and right buttons of a mouse. It doesn’t require fine finger control and the ball is robust enough to be moved (and the buttons pushed) using palms, forearms or feet. The two buttons are located behind the ball which can make its easy to inadvertently knock the position of the cursor when reaching for them. For right-handed users this can often be solved by swapping the buttons across so that the right hand reaches for the right button, rather than across the ball. 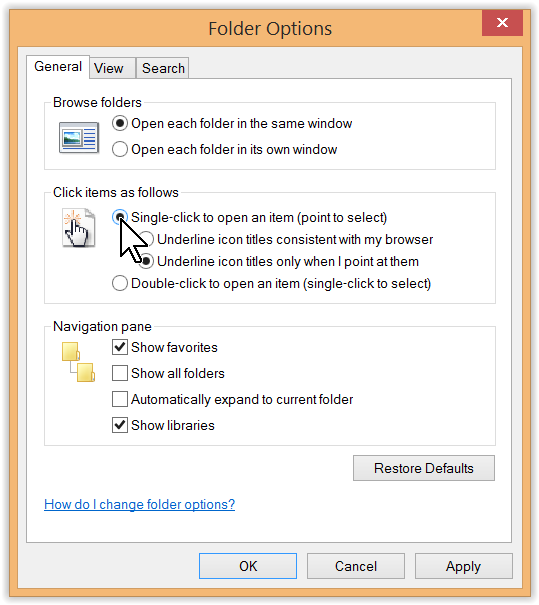 You can swap the buttons over in the Windows Control Panel. Button access difficulties can be solved by buying the switch-adapted version the BigTrack (or by using an additional switch interface) which allows you to connect switches to act as mouse buttons. See a list of trackballs / rollerballs at EmpTech.info. A little more specialist. Joysticks require less control over hand manipulation than the trackballs. Plus a range of different tops can be fitted to a joystick to suit different types of hand grip. The Joystick II is a cut-down “lite” version of the Joystick Plus. It’s missing several features but is significantly less costly and I’ve found that the features that are missing really are rarely used anyway. The joystick has just three buttons: a left click, right click, and a middle button. The middle button operates as a drag-lock for the left button. There are three switch inputs directly on the back of the joystick, doing away with the external adapter box that is a required extra on the Joystick Plus. The Joystick II has a smaller guard than the Joystick Plus as it has no buttons lower on the unit. I have found that this is usually an advantage as a user can push the palm of their hand against the edge of the guard to steady themselves. The handle of the joystick is removable and can be replaced with other handles suitable for the gripping abilities of your user. The joystick is shipped with three standard handles. See a list of specialist joysticks at EmpTech.info. A touchpad is the technical name of the tactile mouse pad built into every laptop. Some people find the small movements required to operate these easier than the standard mouse. The Cirque Smart Cat is a touchpad outside the usual confines of the laptop body. It can be plugged into any computer and positioned easily so that small movements can control the position of the cursor on the screen. The active area of the touchpad can be customised to make it possible to access everywhere on the screen if reach is an issue, even with the movement of a single finger. It does require good finger isolation to perform accurately. See a list of touchpads at EmpTech.info. Though once seen as a specialist technology used largely in special educational needs schools touch, screens are now mainstream. Following on from the success of smartphones and tablets, Windows laptops and all-in-one desktops are increasingly becoming accessible by touch. This is a welcome new technology but the ubiquity of touch-screens is causing a whole new set of touch accessibility issues. Surface Pro 3 is Microsoft’s flagship laptop / tablet hybrid that runs the full version of Windows 8.1. The keyboard can be used to access it like a laptop, or removed so the device becomes more like a tablet. The screen has full multi-touch support just like an iPad. Movement of the head can be tracked by a special sensor (or built-in webcam) to move the mouse pointer around on the screen. In the absence of a mouse button usually a feature in the software called dwell delay is used. Alternatively a well-positioned switch can be used for clicking. The SmartNav 4 clips onto the top of a desktop or laptop screen and tracks the movement of a special silver dot (supplied). The dot is usually placed above the bridge of the nose or on the frame of a pair of glasses. The system is very accurate if the user has dependable head movement. A socket on the device allows you to plug in two switches for left and right mouse clicks or you can use dwell delay software (which requires a steady head and can be quite stressful). See a list of head control hardware and software at EmpTech.info. Modern eyegaze systems are coming down in price. These allow users to move the pointer on the screen using eye movements alone. 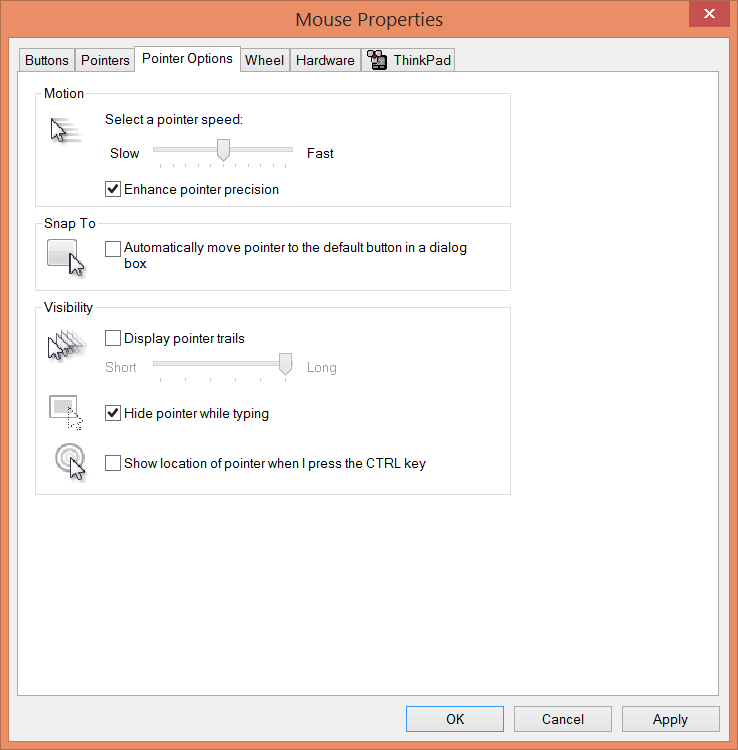 Mouse buttons are replaced with a dwell delay feature or blinks or a switch. The Tobii PCEye Go is a peripheral eye tracker that allows you to access the computer using eye movement as though you were using a mouse. The device uses an advanced dwell delay feature called Gaze Selection which uses a two-step selection process to ensure fewer click mistakes and a more relaxed experience. Although the cost of eye tracking has fallen significantly over the past decade it is still very expensive compared to other technologies available and the accuracy of the system is affected by eye conditions such as nystagmus and by ambient light. It’s possible to control most, if not all, aspects of the Windows computer using voice alone. There is free speech recognition feature built into Windows but most people who need this will pay for a commercial alternative. Speech recognition software has improved a lot over the past decade or so. With Dragon NaturallySpeaking 12 It is now possible to achieve above 99% accuracy when dictating text into the computer. The software can also be used to control the computer (“Print the document”) and browse the internet (“Search Google for Shakespeare”). There are some places it can’t access, however, which can become quite frustrating for users who rely on it. See a list of speech recognition software on EmpTech.info. You can use one or more switches to navigate around a WIndows computer, produce documents, access the Internet etc. It’s not a very efficient way of using a computer but with practice and the right settings it can be very practical. Specialist software and hardware is always required. The Grid 2 is an entire environment for Windows that is accessible by one or more switches. Using the Grid 2 you can browse the internet, send emails, write documents and talk on social media. There are many restrictions and some elements are very inefficient compared to using the other options listed here but for people who have significant loss of movement it does work very well indeed. Windows features built-in keyboard access as an alternative to the mouse for practically all actions you can think of. 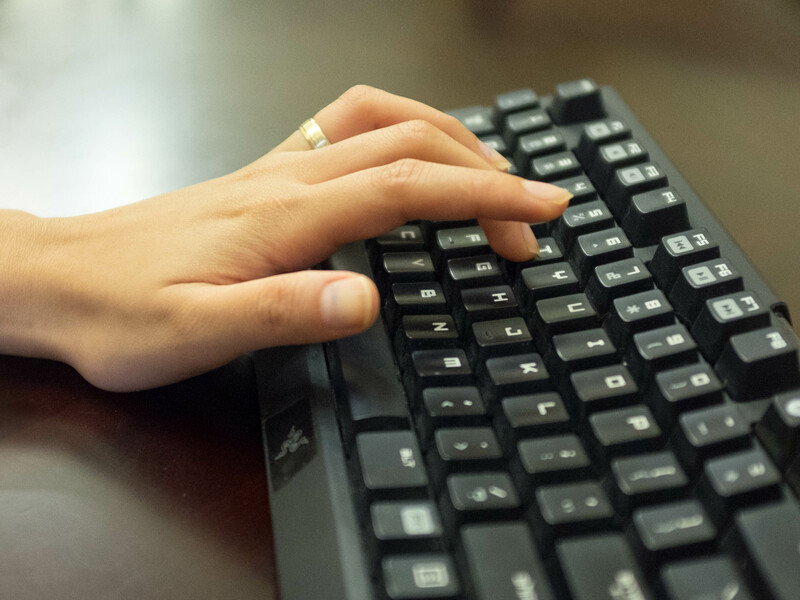 The area that keyboard access can begin to struggle with is when using more complex websites, but there are free software solutions to help overcome these issues. Hello, I’ve been looking for assistive technology to access iOS and android with switches. I have found an affordable website that has a switch adapted joystick for android (http://www.getbrainier.com/home/3-switcheroo-stickmouse.html) and a a switch adapted joystick for iPad and iPhone (http://www.getbrainier.com/home/6-switcheroo-padstick.html). These seem that will be helpful to access tablets and mobiles. They also have a switches only interface with several functions for iOS and android (http://www.getbrainier.com/home/9-switcheroo-tab9.html). Do you think these would be appropriate devices worth trying? The goal is to surf the web, write emails, facebook, text sms play some games and such. I’m not familiar with the GetBrainier brand … yet! I would often recommend the use of a wired switch interface for tablets over a wireless (Bluetooth) one as they are generally more reliable. GetBrainier offer wired switch adaptors for both iPad and Android devices. The switch-joystick and regular mouse joystick look pretty robust. I’m particularly happy about the free OT-style hacks for taps (faucets) and cutlery! gaming on your next update. Sometimes playing games on my computer with my mouse just doesn’t work as well as I’d like it to. I like your suggestion of playing with a joystick instead. I think since joysticks have less buttons, there is a less of a chance to click the wrong thing. Plus it makes it feel like you are playing an old school game like when my parents did! I’ll have to give some of these other options you mentioned at try. Hi, trying to help a friend who has Parkinson’s like hand tremors, very, very difficult to click a mouse, or move a joystick. Have installed Dragon, but once again, although it works well for an able bodied person, at certain times a mouse click is required. And that’s the problem. Is there any assistive tech that a person can actually, 100%, just use voice commands from the get-go?